By buying this product you can collect up to 448 Yachtaid Points. Your cart will total 448 points that will be converted into a voucher towards your next purchase! Must be logged in to collect points. For digital replacements see CSD units. Marine Air conditioner Available in 6000 to 48000 BTU. Marine Air condensing for boats provide cooling and reverse-cycle heating in a highly efficient package. The hermetically sealed, high-efficiency compressor reduces amp draw while pressure switcvhes, thermal overload, and start components provide constant system protection and proper operation. In addition, the expansion device and check-valve assemblies control load balancing during operation. The copper-encased cupronickel condenser coils are highly resistant to corrosion caused by continuous seawater flow, Marine Air Dometic. The CS series of condensing units for boats provides heating and cooling in a highly efficient package. The hermetically sealed, high-efficiency compressor reduces amp draw while pressure switches, thermal-overload, and start components provide constant system protection and proper operation. In addition, the expansion device and check-valve assemblies control load balancing during operation. The copper-encased cupronickel condenser coils are highly resistant to corrosion caused by continuous seawater flow. The symmetrical base design provides optimum space efficiency and installation flexibility for easy handling and positioning of the unit. A built-in hose barb aids in complete condensate removal from the drain pan. Two sets of vibration isolators ensure quiet operation. The electrical box can be mounted remotely. It has a moisture-resistant design with a corrosionresistant enclosure. CS Digital (CSD) units include the Passport I/O circuit board. As with all Marine Air products, quality is assured. Each unit is pre-charged, test-run in all operating modes, and leak-checked at the factory prior to shipping. All surface components are constructed of or coated with materials resistant to fire and corrosion. Charge Guard® protection provides sealed access ports that ensure environmental protection and system integrity. 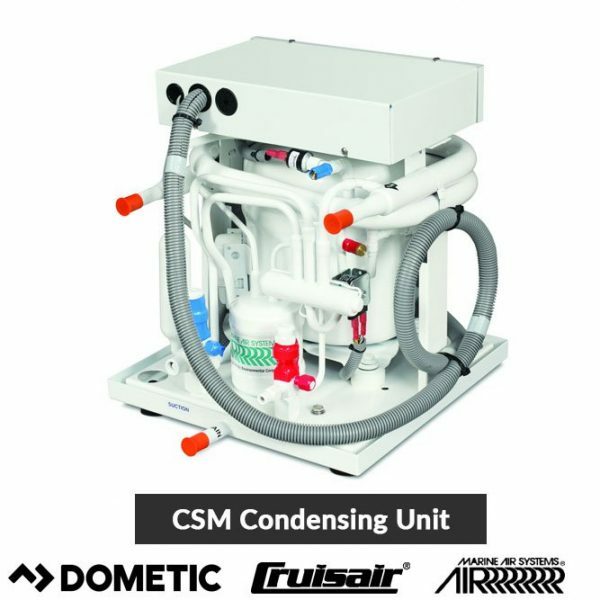 All CS condensing units meet or exceed applicable ABYC and US Coast Guard regulations, CE directives, and general Air Conditioning and Refrigeration Industry (ARI) standards. boat air conditioning, marine air conditioning troubleshooting, cruisair marine air conditioner, marine air conditioning 12 volt, marine portable air conditioning, Marine air systems, Marine air conditioning parts, marine air conditioning sizing, marine air conditioning miami, marine air conditioning parts, marine air conditioning miami fl, marine air conditioning service, marine air conditioning parts, marine air systems parts, marine ac, marine air systems parts, small boat air conditioner, air conditioning sale, cruisair, dometic, marineair.